→ Tales Of Suspense #40 (1) (04/63) Iron Man - Iron Man Versus Gargantus! → Tales Of Suspense #41 (1) (05/63) Iron Man - The Stronghold Of Dr. Strange! → Tales Of Suspense #42 (1) (06/63) Iron Man - Trapped By The Red Barbarian! → Tales Of Suspense #43 (1) (07/63) Iron Man - Kala, Queen Of The Netherworld! → Tales Of Suspense #44 (1) (08/63) Iron Man - The Mad Pharaoh! → Tales Of Suspense #45 (1) (09/63) Iron Man - The Icy Fingers Of Jack Frost! → Tales Of Suspense #47 (1) (11/63) Iron Man - Iron Man Battles The Melter! → Tales Of Suspense #48 (1) (12/63) Iron Man - The Mysterious Mr. Doll! → Tales Of Suspense #49 (1) (01/64) Iron Man - The New Iron Man Meets The Angel! → Tales Of Suspense #51 (1) (03/64) Iron Man - The Sinister Scarecrow! → Tales Of Suspense #54 (1) (06/64) Iron Man - The Mandarin's Revenge! → Tales Of Suspense #55 (1) (07/64) Iron Man - No One Escapes The Mandarin! → Tales Of Suspense #57 (1) (09/64) Iron Man - Hawkeye, The Marksman! → Tales Of Suspense #58 (1) (10/64) Iron Man - In Mortal Combat With Captain America! → Tales Of Suspense #60 (1) (12/64) Iron Man - Suspected Of Murder! → Tales Of Suspense #59 (1) (11/64) Iron Man - The Black Knight! → Tales Of Suspense #63 (1) (03/65) Iron Man - Somewhere Lurks The Phantom! → Tales Of Suspense #65 (1) (05/65) Iron Man - When Titans Clash! → Tales Of Suspense #66 (1) (06/65) Iron Man - If I Fail, A World Is Lost! → Tales Of Suspense #67 (1) (07/65) Iron Man - Where Walk The Villains! → Tales Of Suspense #68 (1) (08/65) Iron Man - If A Man Be Mad! → Tales Of Suspense #69 (1) (09/65) Iron Man - If I Die, Let It Be With Honor! → Tales Of Suspense #70 (1) (10/65) Iron Man - Fight On! For A World Is Watching! → Tales Of Suspense #71 (1) (11/65) Iron Man - What Price Victory ? → Tales Of Suspense #72 (1) (12/65) Iron Man - Hoorah For The Conquering Hero! → Tales Of Suspense #73 (1) (01/66) Iron Man - My Life For Yours! → Tales Of Suspense #74 (1) (02/66) Iron Man - If This Guilt Be Mine...! → Tales Of Suspense #75 (1) (03/66) Iron Man - The Fury... Of The Freak! → Tales Of Suspense #76 (1) (04/66) Iron Man - Here Lies Hidden... The Unspeakable Ultimo! → Tales Of Suspense #77 (1) (05/66) Iron Man - Ultimo Lives! → Tales Of Suspense #78 (1) (06/66) Iron Man - Crescendo! → Tales Of Suspense #81 (1) (09/66) Iron Man - The Return Of The Titanium Man! → Tales Of Suspense #82 (1) (10/66) Iron Man - By Force Of Arms! → Tales Of Suspense #83 (1) (11/66) Iron Man - Victory! → Tales Of Suspense #84 (1) (12/66) Iron Man - The Other Iron Man! → Tales Of Suspense #86 (1) (02/67) Iron Man - Death Duel For The Life Of Happy Hogan! → Tales Of Suspense #87 (1) (03/67) Iron Man - Crisis... At The Earth's Core! → Tales Of Suspense #88 (1) (04/67) Iron Man - Beyond All Rescue! → Tales Of Suspense #89 (1) (05/67) Iron Man - The Monstrous Menace Of The Mysterious Melter! → Tales Of Suspense #90 (1) (06/67) Iron Man - The Golden Ghost! → Tales Of Suspense #91 (1) (07/67) Iron Man - The Uncanny Challenge Of The Crusher! → Tales Of Suspense #92 (1) (08/67) Iron Man - Within The Vastness Of Viet Nam! → Tales Of Suspense #93 (1) (09/67) Iron Man - The Golden Gladiator And... The Giant! → Tales Of Suspense #94 (1) (10/67) Iron Man - The Tragedy And The Triumph! → Tales Of Suspense #95 (1) (11/67) Iron Man - If A Man Be Stone! → Tales Of Suspense #96 (1) (12/67) Iron Man - The Deadly Victory! → Tales Of Suspense #98 (2) (02/68) Iron Man - The Warrior And The Whip! → Iron Man (1°) #1 (1) (05/68) Alone Against A.I.M.! 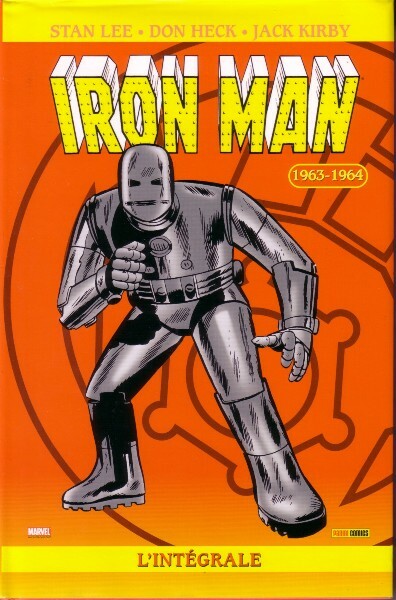 → Iron Man (1°) #2 (06/68) The Day Of The Demolisher! → Iron Man (1°) #3 (07/68) My Friend, My Foe... The Freak! → Iron Man (1°) #4 (08/68) Unconquered Is The Unicorn! → Iron Man (1°) #5 (09/68) Frenzy In A Far-Flung Future! → Iron Man (1°) #6 (10/68) Vengeance... Cries The Crusher! → Iron Man (1°) #8 (12/68) A Duel Must End! → Iron Man And Sub-Mariner #1 (1) (04/68) Iron Man - The Torrent Without... The Tumult Within! → Iron Man (1°) #10 (02/69) Once More... The Mandarin! → Iron Man (1°) #11 (03/69) Unmasked! 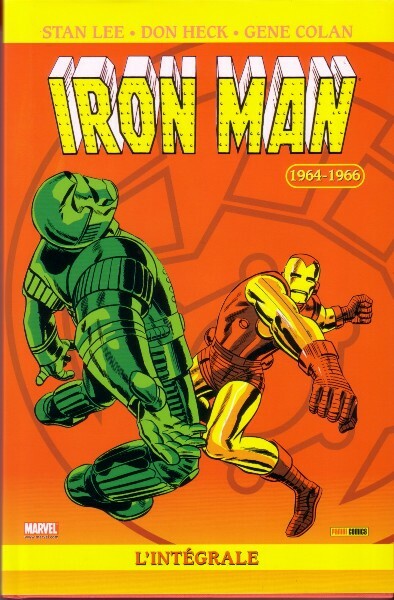 → Iron Man (1°) #19 (11/69) What Price Life ? → Iron Man (1°) #20 (12/69) Who Serves Lucifer ? → Iron Man (1°) #24 (04/70) My Son... The Minotaur! 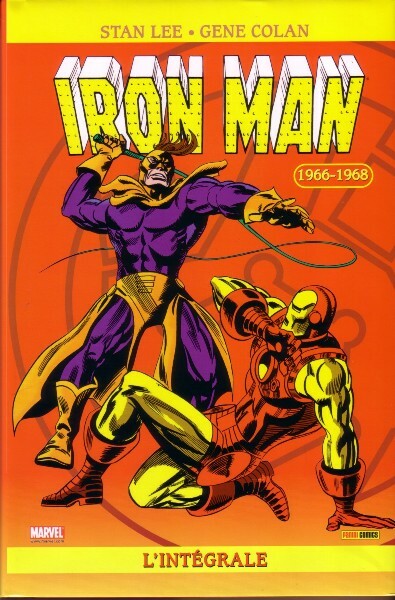 → Iron Man (1°) #26 (06/70) Duel In A Dark Dimension! → Iron Man (1°) #29 (09/70) Save The People... Save The Country! → Iron Man (1°) #44 (1) (01/72) Weep For A Lost Nightmare! → Iron Man (1°) #47 (06/72) Why Must There Be An Iron Man ? → Iron Man (1°) #49 (08/72) ...There Lurks The Adaptoid! → Iron Man (1°) #50 (09/72) Deathplay! → Iron Man (1°) #51 (10/72) Now Stalks The Cyborg-Sinister! → Iron Man (1°) #44 (2) (01/72) The Astonishing Ant-Man - Armageddon On Avenue "A"
→ Iron Man (1°) #56 (03/73) Rasputin's Revenge! → Iron Man (1°) #57 (04/73) Strike!